You are currently browsing the category archive for the ‘Shut Down BMI’ category. BMI Airlines carry migrants who are being forcibly deported from the UK against their will and in the process are making huge profits from human misery. The people BMI forcibly deport certainly haven’t done anything wrong. But they are being treated as criminals for doing what humans have done for thousands of years – moving to escape war, persecution, torture, physical abuse and poverty. 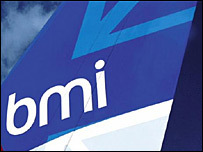 This coming Tuesday 20th January will be the fourth day of action against BMI Airlines. We once again call on all those who oppose the deportation industry and the inhumane treatment of migrants to contact BMI and let them know what you think of their profiteering from this cruel practice. 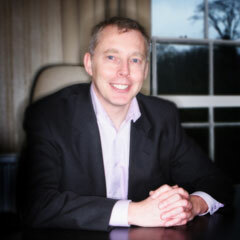 As the campaign against them gathers pace, it is clear that BMI will be beginning 2009 in a similar way to that of 2008. Last January, the airline were heavily criticised for twice attempting to deport Veneera Aliyeva and her two young children who had been living in Swansea. 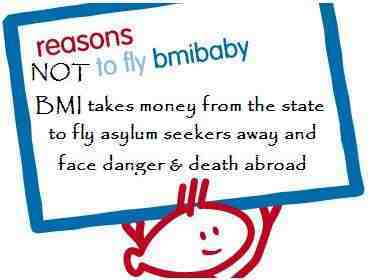 On the most recent ‘Shut BMI Airlines day’ on December 20th, No Borders South Wales activists went to Cardiff International Airport where ‘Bmi baby’ operate flights from. Bmi baby is a subsidiary company of BMI Airlines. The aim of the visit was to hand out leaflets explaining how BMI Airlines make money from the practice of carrying people against their will to places they do not want to go to. After only a few minutes of giving out leaflets in the terminal, including to employees at the Bmi baby desk, the airport manager advised that he would have to call the police. Four officers from the ‘Airport Police Group’, armed with guns and tasers, quickly caught up with us and informed us that we were being stopped and searched under Section 44 of the Terrorism Act. Despite questioning our obligation to provide our names and addresses, we were told that we would be arrested, detained and questioned by ‘Special Branch’ if we refused. The Stop and Search records that we were given identify no grounds for search apart from ‘operation aviation’. If these officers had real concerns that we were a terrorist threat, then surely they would have actually searched us and our belongings. However they did neither. Their use of the Terrorism Act served to intimidate us and to stop our protest, as well as attempt to gather further information about us. It is another clear example of the intensification of the surveillance society and the growing criminalisation of protest. The state has used the fear of terrorism to bring in a raft of new legislation that give the police unprecedented powers. One particularly worrying change, as we and others have reported previously, is the emergence of an unaccountable, privatised police force. The implications these changes have for social control represent a major threat to everyone’s freedom. At around 6pm on Dec 15th, a group of no borders activists paid Cardiff’s Winter Wonderland a visit. As the event is sponsored by Bmi baby, a subsidiary of BMI Airlines, we thought that it would be an ideal opportunity to let the people of Cardiff know about BMI’s less palatable activities and of our growing campaign against them. By sponsoring an event like Winter Wonderland, BMI attempt to portray themselves as a caring, family-friendly company. However, nothing could be further from the truth. Not wishing to be complete kill-joys, we made the effort and dressed up for the occasion. Sporting sad baby faces, we handed out over 100 leaflets informing people of BMI’s role of carrying migrants against their will and the huge profits they make from the human misery this causes. We were aware that we were leafleting at a family-orientated event and we were not aiming to disrupt or block anyone’s enjoyment of Winter Wonderland. However, despite no negative comments or objections raised by members of the public, we were asked to leave by someone in charge. Leaflets were then given out at the entrances outside of Winter Wonderland to passers by, but even this activity was disrupted by a security officer who told us that we had to leave the area, as the land (including the roads and pavements) in front of the City Hall was all private property! 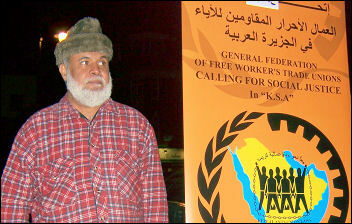 He then snatched leaflets from the hands of two activists. However, we continued giving leaflets to people and left of our own accord after about an hour of leafleting. Information about the BMI campaign has appeared in PeaceNews, The St Petersburg Times and Pinknews. This coming Saturday 20 December will be the third day of action against BMI Airlines. We once again call on all those who oppose the deportation industry, and the inhumane treatment of migrants who are subjected to the wider regime of control that it forms an integral part of, to contact BMI and let them know what you think of their profiteering from this cruel practice. A full list of contact details can be found on this leaflet. Being a Saturday, we suggest that callers focus on phoning the Reservations & General Enquiries numbers :01332 854854 & 01332 648181 and the Bmi baby Reservations, 01332 648181. The shut-down BMI campaign day coincides with a day of action that has been called in solidarity with the recent uprising in Greece, which erupted following the murder of a teenager Alexandros Grigoropoulos by a police officer in Athens on 6 December. As a migrant solidarity organisation we stand with all those struggling against state repression and for freedom and equality for all! Friday 12/12, the assembly of the occupied Athens Polytechnic decided to make a callout for European and global-wide actions of resistance in the memory of all assassinated youth, migrants and all those who were struggling against the lackeys of the state, Carlo Juliani; the French suburb youths; Alexandros Grigoropoulos and the countless others, all around the world, a day of international action against state murders, Saturday 20.12.2008. Our lives do not belong to the states and their assassins! The memory of the assassinated brothers and sisters, friends and comrades stays alive through our struggles! We do not forget our brothers and sisters, we do not forgive their murderers. Please translate and spread around this message for a common day of coordinated actions of resistance in as many places around the world as possible. We are planning to again distribute leaflets about BMI’s role in deportations at Winter Wonderland on Thursday 18 December. Meet 5.30pm on the National Museum steps. The 20th November was the second day of action against BMI, for their part in the deportation of BB and their continued willingness to carry out removal flights for the UK Border Agency. Media coverage of the day of action was limited to NewsWales, Pink News, Indymedia and High on Rebellion. Many people were contacting BMI because they were due to deport Jila Kalkhoran and her sons, Emad and Aref Pirouzeh on Friday, though thankfully a judical review has intervened. Though there were some concerns over BMI’s response to phone calls, we are confident that this campaign is building momentum, we encourage everyone to organise against BMI on the 20th of each month- let them know that their involvement in deportation is not acceptable! this dysunited nation of red. white. and. blue. Lethargy performing “No Excuses” originally by Alice In Chains. With the start of the campaign to shut down BMI just around the corner we thought we’d fill you in on what BMI’s CEO Nigel Turner had to say in relation to their carrying out of deportations. The extracts are taken from an email correspondence between Nigel and a member of the public, who on reading about BB’s deportation decided to contact Nigel to inform him of the negative impact that BMI’s role in deporting people could have on the company. “I fear we are not going to agree on this one, to take your stance would involve us making a decision that the UK borders and the Courts of the land do not properly safeguards of individuals.